Set pretty well mid-way between Quimper and Brest, in the Heart of the Armorique Park Reserve is this superb 1905's industrial mill which has been converted into a spacious home in an idyllic setting. 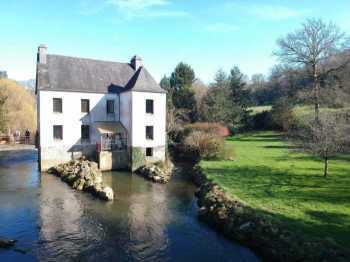 The mill itself is in the middle of the river, thus access to the property from the parking area is done via a bridge. From the entrance hall comes the massive open plan "living room" with fitted kitchen (with its own cellar), dining area, lounge area and a study area in the wing. Then upstairs you have a large landing area, master bedroom with ensuite bathroom, large double guest bedroom, bathroom, toilet and study. All the rooms have great views out over the river, whether it be upstream or down. Then on the top floor you have one room over the whole floor space, which was used as a dormitory, there is a toilet and sink in one corner, thus the supplies reach this floor and give the possibility of extra bedrooms, bathrooms, etc. The mill is self-sufficient in electricity with a 14KW turbine running off of the river, in fact it provides enough power for the mill and its neighbour! The mill sits on the edge of 14 acres of land, mainly sloping small prairies but all grouped in one block and profits from over 1500 ft of water frontage. The is a small stable block and haybarn on the site.